Transformations made on a drawing layer, such as rotation, scale, skew and flip, are made relative to the position of the drawing's pivot point. While making transformations using the Transform tool, you can drag and drop your selection's pivot. However, this has no permanent effect. It will only temporarily change the pivot's position to help you make transformations at the selected frame, but the actual pivot point of your drawing layer will remain the same. 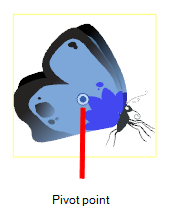 You can reposition a layer's pivot point permanently using the advanced animation tools. See to learn how the original pivot is set. In the Advanced Animation toolbar, select the Translate , Rotate , Scale , or Skew tool. In the Camera view, Ctrl + click (Windows/Linux) or ⌘ + click (Mac OS X) to select your element. The pivot point appears in the Camera view. Drag the pivot point to a new position. NOTE: When you permanently move the pivot point, of a layer that is already animated, all the transformations done on the layer on other keyframes will be recalculated according to the new pivot point's position. 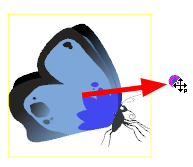 Therefore, your existing animation will look completely different, except at the current frame. It is recommended to always make sure your pivot point is at its ideal position before you start animating.